Pattaya hasn’t always been Thailand’s major Entertainment Center for Tourists. Versions of it’s published history will claim that the name either derived from the Thai language for the prevailing winds (pad tha ya), or was named by King Taksin (c1787) whilst he was dealing with Burmese invaders. Whether either or neither may be true this jewel of the Gulf of Siam was a small fishing village until the 1960’s. During the Vietnam War (1955-1975) the Town grew massively when used as an R and R base for the American and Allied forces. The first 100 troops were dispatched to the nearby U-Tapao airbase in 1961. In the last 50 years Pattaya has grown from the seedy beginning of Bars and Go-Go Clubs to a modern bustling city of some 300,000 residents. A burgeoning ExPat community continues to grow. 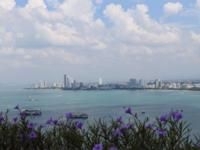 Many of the European residents are over 50 and have chosen Pattaya as their retirement homes. With their influx and Pattaya’s popularity with moneyed Thais from Bangkok the skyline is now dominated with Luxury Hotels and Condominium blocks. The expansion continues year on year. 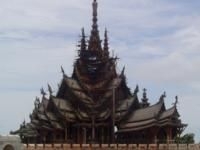 2011’s Pattaya offers an unbelievable variety of Entertainment and fun Pursuits. There are Golf courses , Modern Shopping malls, Elephant Shows, Water-sports, Zoos, Go Carting, Shooting Ranges, Horse Riding, Cabaret shows to name a few of the distractions for both visitor and residents. As well as Luxury to Budget Hotels, Pattaya boasts some of the finest and varied Dining experiences found anywhere in the world. With the City’s Tropical climates visitors can expect Year round warm temperatures and apart from the Rainy Season, clear skies and sunshine. We at My Guide Pattaya are here to enhance your experience through constantly updated local information with news of upcoming events, reviews of Restaurants, Hotels and Attractions and an interactive site to please all visitors to this great destination. For the Traveler we believe that Pattaya, with its superb Hotels, is a perfect base for visits to many wonderful places throughout the East Coast of Thailand. The East Coast stretches from Chonburi and Sri Racha to the North of Pattaya to Sattahip, Rayong, Koh Samet, Chantaburi and Koh Chang to the south. Or Koh Chang the biggest Island serviced by Car Ferry, with wonderful beaches, Waterfalls and clear water.